Renowned research house Frost & Sullivan recently released a study into the future of ‘Fintech’ in Australia. The study – Australia – Trends, Forecasts and Analysis 2015 – 2020 highlighted that wealth management solutions would continue their rise and rise to making up 35 percent of the local fintech market by 2020. This week we take a look at the results and interestingly review the wide range of wealth management solutions they have identified as being influential. The report outlined the ‘key to fintech and traditional bank success’ includes artificial intelligence-powered and, complex digital ecosystems a core part of improving customer experience and retention. Digital is the customer service nirvana for wealth managers, delivering convenient platforms and ease of use for consumers and business. Peer-to-peer networks and algorithm based investment planning are designed to deliver fast and highly cost-effective access to investment opportunities. AI in this instance can analyse customer behaviour and detect the patterns of behaviour behind fraud and other financial crimes. AI systems with data analytics modules, algorithm-based banking with complex projection algorithms and robo-advice will become the bedrock of financial planning, significantly disrupting the sector. They have the ability to transform the underlying data into structured information, produced tailored financial advice plans much faster than is humanly possible. 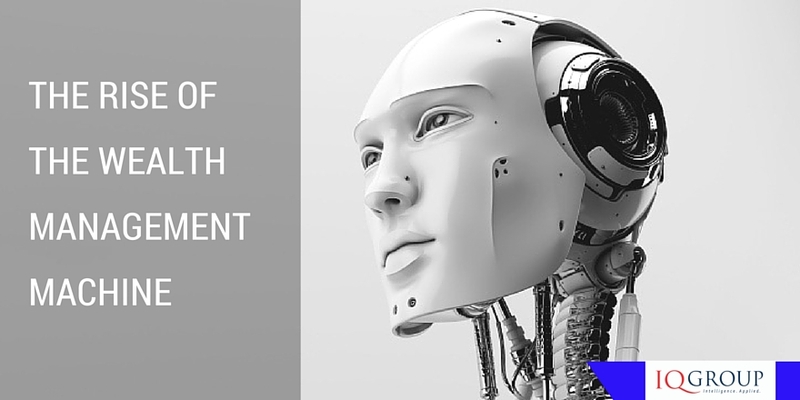 The outcome will be virtual robo-advice teams replacing financial advisors. Algorithm-based banking will enter the superannuation arena, relying on the overall size and stability of the sector to grow funds larger and faster. ‘Smartphone prevalence facilitates a high adoption rate for a more convenient and secure form of paying compared to physical cards or cash,’ said Saranga Sudarshan, research analyst, ICT Practice, Frost and Sullivan Australia and New Zealand. And also newer digital technologies like blockchain and biometric analysis to improve security and connectivity for financial services will grow in popularity as financial settlements review the benefits of decentralised ledger technologies for more secure settlements. Frost & Sullivan believe blockchain will impact financial systems in late 2017 and early 2018. Within the report, the research house identified a short list of influencers and those to watch – some may be familiar and some may not. They include Prospa, Society One, OnMarket BookBuilds, Nimble, Stockspot, Yourshare, Pocketbook, Vashwerkz, Investsmart, and TradeFloor. What does technology neutrality really mean? In early May the Minister for Small Business and Assistant Treasurer, the Hon Kelly O’Dwyer MP, released a proposal paper entitled ‘Technology neutrality in distributing company meeting notices and materials’ for public consultation. I could give you the government’s wordy explanation of ‘optimal outcomes’ and ‘embedding principles of technology neutrality in the communications requirements’ or I could just call it like it is. Company meetings are still driven by paper and this is not something that Australians, let alone the superannuation industry should be proud of. The government is hoping that its intervention will achieve technology neutrality in communications. This will see data in more usable forms (digital), in a timely manner (real time digital), lower cost (digital) be more flexible in how it’s presented (digital and hard copy – something for everyone). Unless you have opted out of Australia’s dedication to paper then you are still going to be churning through many superannuation fund investments into organisations that are by law obliged to meet corporate governance requirements and hold meetings. 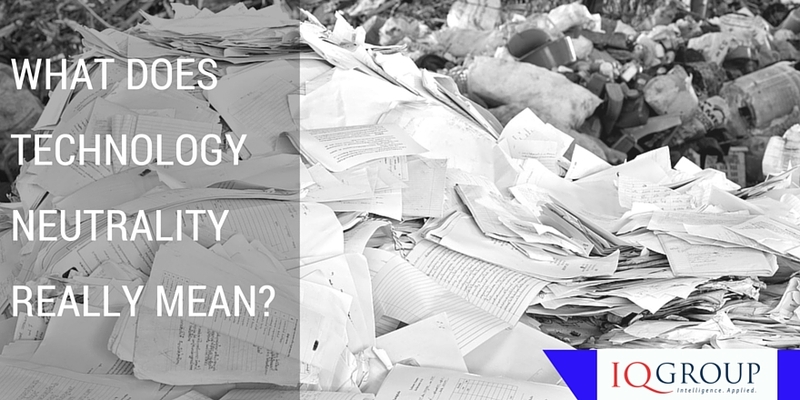 Generating paper agendas, envelopes, minutes, handouts, brochures, annual reports, committee reports – you name it. It’s in print. Research underpins the seriousness of this issue and why the government has stepped in. Forest Ethics’ recent research confirmed that in Australia we consume on average 230kg per person per year. To give you some idea of what that equals – roughly half the weight of a polar bear. But here is the tricky part – we consume more than North America (229kgs), Western Europe (179kg) and Asia (41kg). Our demand for paper is never ending – despite Australians owning on average two mobile phones each and our love for texting, Netflix and high speed broadband. It’s unthinkable that we have to deliver exponential resources for paper alone – and for this we have cleared half of our forests and send half of our paper straight to landfill each year. This initiative for technology neutrality in communications is one that IQ Group has been supporting for some time and we have worked with some of Australia’s leading funds and private and public enterprise to streamline meeting and Board communications electronically. Recently I highlighted APRA’s considerations on the efficiency and productivity of the superannuation industry. The concept of straight through processing is where our industry can overcome this ‘paper-want’ and make a positive contribution to our sustainability as a nation and as a business community. Maybe digital is going to deliver more than we plan when we look at our member journey? It’s quite possible that it could be the most positive environmental action that we take. How efficient and competitive IS the super system? With all of the focus on the Federal election and the changes to superannuation from a taxation perspective, it’s important to remember that we still have a job to do. With the goal for the raft of Stronger Super and SuperStream initiatives to produce a system that is easier to deal with, it’s an interesting marker point for the Productivity Commission to now have its say on exactly that. Have we built a better mousetrap? From APRA’s perspective “An efficient and competitive superannuation system should lead to enhanced retirement outcomes for members”. Whilst many of us within the industry for years have been focusing on the retirement outcomes, it’s now time for us to collectively prove that we have made inroads to being more efficient and more competitive. For the regulator it’s not a simple case of lower your fees and better outcomes for members will follow. APRA acknowledges that there are a wide range of variables that will influence the outcomes for fund members. Investment performance is impacted by insurance policies and potential influencers of fees, costs, taxes and when and how members access their savings. Of more importance is taking a look at the entire performance measures and assessing whether the net return for members has been achieved. In plain speaking, how well you are able to retire. And for many Australian workers facing hefty mortgage re-payments and a reduction in the amount of money they can allocate to a low-tax super environment, there very well may be a greater search for value than ever before. In a way we now have to take our own medicine. For years we have built up investment incomes for fund members to help them plan for the future. Now it’s our turn. And with this increased focus on strategic and business planning processes for RSE licensees is the clear message that it is our turn to join the wider financial services industry with the same set of checks and balances, the same level of investment into new or enhanced systems and processes that deliver ‘enhanced member outcomes’ as well as the proper management of cost and risk. And to shine a light on why this is all so relevant is the changing demographic that Australia faces. These changes will impact the growth and cash flow component for funds and in fact changes are being felt now. Cash outflows are ‘slowly trending upwards’ with 45 percent of APRA-regulated funds having a net cash outflow ratio ‘exceeding 100 percent for year ending June 2015’. Australians are also very slow to move away from the lump sum superannuation payout tradition, placing even further stress on funds. So where to for the industry with its 40,000 odd superannuation offerings? APRA has made a stand that traditional measurement techniques – short term and against competitors – needs to be reworked and instead focus on the appropriate overall retirement outcomes. Did they over the course of the member’s superannuation journey deliver? For some they may wholeheartedly believe that they are delivering on their contractual obligations to fund members. However, for the 570,000 SMSFs controlling $600B in assets they may beg to differ and this move towards a more direct, transparent and informed structure continues to gain traction. APRA itself has acknowledged that much more can be done to achieve a more transparent environment for fund members, such as the ‘reporting and disclosure of fees and costs’. Also of note was the trend to insource investment management to achieve greater control and potentially drive costs down. However, this may not be the most efficient nor competitive outcome for a fund – it simply may not have the expertise and services internally and establishing these requirements can be a significant investment. The one thing that we can all rely on at this point is change. It will continue and how we respond to it will shape our collective futures. Even though there was much speculation before the Budget about the superannuation changes it might contain, I was nonetheless surprised about the wide range of measures that it contained. This is the most comprehensive package of change to super in over a decade. I provide a summary of most but not all of these below. The Government will be raising another $6 billion in revenue from the top 4% of super account holders and will spend $3 billion of that on the other 96% – especially low income earners and women. The Low Income Superannuation Contribution scheme (LISC) scheduled to be abolished from June 2017. LISC will be continued as the Low Income Superannuation Tax Offset (LISTO). People earning less than $37,000 receive a super rebate of up to $500. This will benefit 3 million Australians, including 2 million women. The threshold for the 30% concessional contributions tax (previously applying to those earning over $300,000) has been reduced to $250,000. About 3% of Australians will have to pay the higher contributions tax but implementation of this extended measure is likely to involve a high degree of administration. Personal super contributions will be tax deductible for everyone, not just the wholly self-employed. This effectively means that everyone will have access to salary sacrifice and won’t be constrained by the terms of their employment contracts. Lots of people may receive a benefit from participation and cost to the Government is estimated at $1 billion. There will be a $1.6 million cap on the amount of super that can be transferred tax-free into retirement phase. While this won’t affect many people, it will save the Government over $2 billion. This will be retrospective back to 2007, and amounts over the cap will either have to stay in an accumulation account (and attract 15% tax on earnings) or be taken out of super. In probably the least popular superannuation measure, the concessional caps are to be reduced to $25,000 for all people – a reduction of $5,000 for people less than 50 years of age and $10,000 for those over 50. However, if you have an account balance of under $500,000, any unused concessional caps will be able to be rolled over for 5 years. Like the LISTO, this is specifically marketed by the Government as a measure intended to improve super for women. A lifetime non-concessional cap of $500,000 will be introduced, replacing the current cap of $180,000 per year (or $540,000 brought-forward every three years). While this seems like a very significant reduction, it may not impact very many people. People aged 65 to 74 will be able to continue making contributions to their superannuation, regardless of their employment status. The current strict work tests will be abolished. The existing spouse tax offset which currently applies to spouses earning $10,000 will be made available to spouses earning up to $40,000. This will soundly increase the number of couples that will be able to access this tax benefit. In a particularly surprising move, the Government has confirmed it will legislate the objective of super as being the provision of retirement income to supplement or substitute the age pension. This is the definition recommended by the Financial System Inquiry, but was not expected to be progressed until later this year. The little known, often misunderstood and inconsistently applied anti-detriment payment arrangements are being axed. These payments involved the refund of contributions tax to deceased super fund member’s estates. In a curious exchange of tax exempt statuses, the earnings tax exemption in retirement products will be extended to most annuities, while the earnings tax exemption will be removed from Transition to Retirement (TTR) income streams. The first measure is a welcomed removal of a barrier to innovative product development, while the latter is intended to reduce the use of TTR for tax minimisation. The Government intends that these changes will also be replicated in defined benefit funds. The implementation of these changes will require the support of considerable legislative change, with the interaction between different elements needing to be carefully managed to ensure that unintended consequences don’t occur. Super funds will also need to gear up to make very extensive process and policy changes to accommodate these changes as they apply retrospectively as well as in the future. The administration of super will become even more crucial as the industry transforms to support these changes and potentially more.